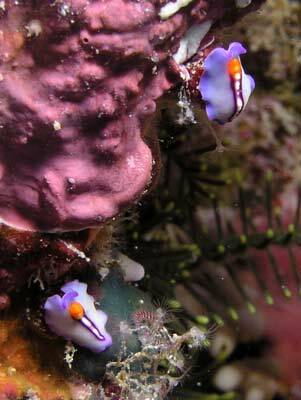 Chinamans Reef is one of the closed reefs to Port Douglas. 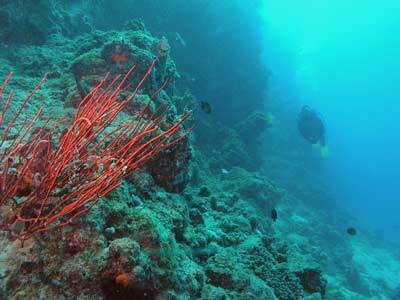 It is 48 kilometres north-east of Port Douglas and on liveaboard dive trips it is one of the spots that you may do your last dive. 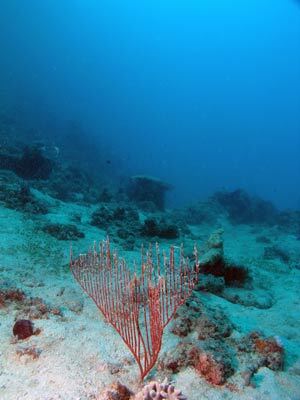 The site I dived is on the north-eastern corner of the reef. Here the reef runs south and the plan was to do a drift dive in this direction. We were dropped at about GPS Reading S16° 12' 40.6" E145° 48' 44.0" using WGS84 as datum. After been dropped close to the reef, we descended to see that the reef wall dropped to 35 metres and then sloped a bit further to 40 metres plus. From here it was sand. As this was our second dive of the day and some had to fly the next day, we took it easy and only went to about 25 metres. 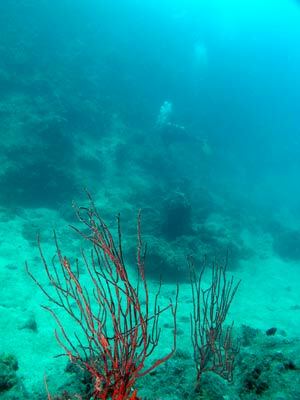 The wall at first was a bit bare of growth but a bit further along some gorgonias and sea whips started appearing. Some of these were simply brilliant in colour, with bright reds prominent. Along the wall we drifted but I saw no sharks and very few big fish. A large turtle was seen but that was about it. After 30 minutes of drifting at a gradual pace (you could swim against it - say 0.25 knots) the depth of the bottom comes up a bit (to say 25 metres) and around here you will come to a bay (well, that is what it looks like underwater) with large bommies. Past here the depth drops back a bit to perhaps a bit over 35 metres. Just past the bay the reef continues on in a southerly direction and then there is at least one gully that runs up into the reef. We headed up one of these and ended our dive in this area. Here there was a lot more fishlife, but only small reef fish. 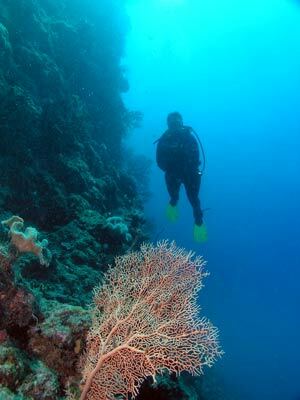 The visibility varied a lot on this dive. In spots it was about 35 metres but in some spots it dropped to only 15 metres, but this soon opened up again to be better. Strange! Water temperature was 26° in November. Not the greatest dive site and to be honest, far better ones exist but the closeness to Port Douglas may mean you do on a day trip from there or if you are doing your last dive on a liveaboard.